On yesterday's post I talked about the existence of completely passive, non-recirculating hydroponic systems and how they can be successfully used for the growth of almost any hydroponic crop you can imagine. Following on this post's idea today I want to share with you some tips to use this type of system with larger plants so that you can effectively setup your own hydroponic passive farm with the least amount of effort and chance of failure. On today's post I will talk about the media and system characteristics for the raising of large plants, particularly plants like tomatoes, cucumbers and bell peppers which require large amounts of oxygen, nutrients and solid media support. If you read the previous post you might remember that when using large plants -like the ones mentioned above - the best thing is to use a media filled container in which the nutrient solution is first close to the surface and then slowly gets used and evaporates from the nutrient solution. However it is also important here to say that there are some specific requirements for the media and some important changes that can be made to guarantee that success will be much more likely to happen. 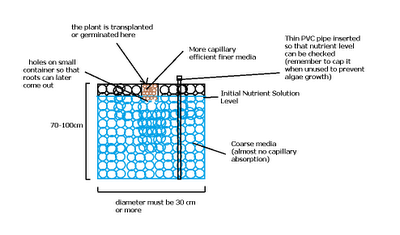 The solid media used is better divided in two, the first media is a highly absorbent, capillary efficient media (like rice husk combined with sand 1:1) which is put in a small cup or container while the second media is a non-absorbent very capillary deficient media like gravel which is used to occupy the rest of the available space. Other coarse media can also be used to fill the rest of the container like vermiculite or other types of rocks. The important thing here is that the whole media must NOT be efficient at capillary absorption because this will make the whole media wet all the time and it will drown the roots since the "air space" will be non-existent. You can follow the diagram above to build a system for a large plant. Note that the container for a large cucumber or tomato plant must be at least 5 gallons and solution needs to be added at a rate of about 1 gallon a month through the crops full life. Note that inserting a small PVC pipe to control volume within the container is always a good idea since you don't want to put so much solution to drown the roots and make the plant die. Mature tomato plants require a space of at least 50cm of air roots when they are older for their proper development so make sure the container you use is about 70-100 cm tall when you build your system. Hopefully with this advice you will be able to start your first passive large-plant hydroponic garden without using any electricity. Also remember that this setup requires absolutely no EC or pH adjustments since once added the solution won't be able to be modified. This however does not cause any problems since the plants adapt to the solution and pH levels acquired. 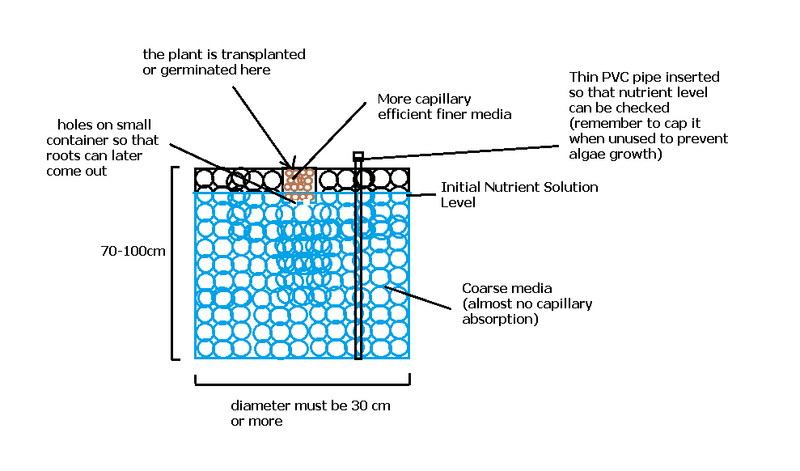 You can also increase the EC or change the nutrient ratios depending on the plant's stage when you perform the monthly nutrient solution additions to your plant's personal reservoir. Please feel free to leave any comments with your experiences with this technique ! Hi! Im interesting on this idea, but i have a question that could not use any substrate to achieve this? Hello Daniel, <br /><br />Thank you for your reply. My whole idea is that I want to use a water bottle as container which filled with water. And put the plant to touch the water. I am not really sure that will be ok? <br /><br />Thank you. Hi Cyprian, You can easily grow hydroponics outdoors. The cheapest system is using a kids pool as a reservoir or an open top tank, shade cloth over top, then using a ball valve garden timer to feed through a 120 micron disc filter, then through pressure compensating drippers, (TORO 2LP/HR is the best) Just us low dense poly and 4mm spaghetti to connect. You can drip feed a few times a day into just straight coco peat or soil and perlite or sand or just dirt and mulch mixed anything the will give some airation and drainage so that not too much water is hanging around the roots for too long. Though spraying phosponic acid every 2 weeks will prevent any of that. Design you nutrient solution as direct addition keeping it in powder form as a + b. drop a into a 70L garbage bin full of water and stir with a short paddle for about 30 seconds, once diluted then bucket it into the reservoir and mix it about a half wirlpool rotation, repeat with part b, ph adjustment and a couple of full rotations from both ends stirring, check EC at both ends to ensure even mix and its done.